It has been just over four years since Moroccans voted to officially consolidate nearly two decades of reform with a new Constitution designed to establish a constitutional monarchy with separation of powers; delegate enhanced responsibilities to local and regional governments; and reinforce clear support for the multicultural, multi-religious character of Moroccan society. In addition to setting the parameters for power sharing between the Monarchy, the Head of Government, and the Parliament, the Constitution called for the adoption of 19 organic laws on these issues and others ranging from political parties to the judiciary. Four years on, where do things stand? On the separation of powers, the Constitutional provision requiring the Head of Government to be appointed from the party that wins the most seats in Parliament was established with the November 2011 legislative elections, in which the Justice and Development Party (PJD) won the largest number of seats and its leader, Abdelilah Benkiran, became Prime Minister and formed a coalition government. Though the PJD-led coalition experienced a number of shake-ups, it has navigated the larger political transition resulting from the 2011 Constitution in cooperation (and not in contestation) with King Mohammed VI and the Parliament, as well as other political parties in Morocco. The balance of power between these groups shifts according to the issue, but for the most part they work together to advance reform, raising some questions about the significance of Constitutional changes vis-à-vis the separation of powers in the Kingdom. The King still plays a large and decisive role in politics, and it seems that his role as arbiter is still welcomed by both government and civil society, especially on matters of religious affairs, social and cultural transitions, and defense and security. Until political parties and Parliament improve their own capacity to govern, it seems that this will remain the case. As for devolution of power to the local and regional level, this process is ongoing. Several organic laws defining the parameters of this decentralization have been adopted in preparation for communal elections in September and October 2015, which are expected to jumpstart the implementation of “advanced regionalization.” In those elections, members of the Regional Councils will be elected by direct universal suffrage for the first time. 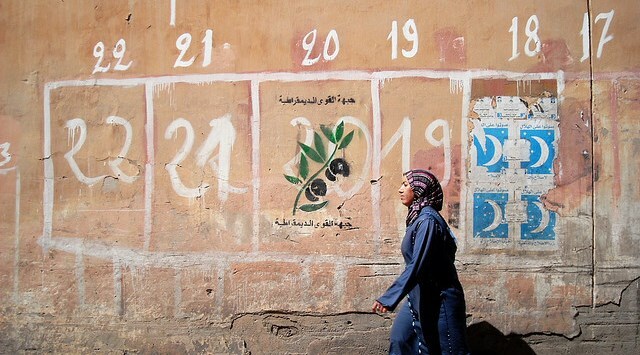 And in keeping with Morocco’s commitment to gender equality, organic laws on regionalization have also increased women’s representation at the local and regional level – with a 27% requirement in Communal Councils and a 1/3 requirement in Regional Councils. This is in addition to the requirement that 60 seats in Parliament go to women, a policy that has increased the percentage of women in parliament to 17%. However, the Authority for Gender Equity and the Fight against all forms of Discrimination mandated by the Constitution has yet to be established. The Constitution’s provisions establishing an independent agency to promote civil and human rights protections have been fulfilled and have helped promote a culture of human rights in the country. The National Human Rights Council (CNDH), enshrined in the Constitution as a fully autonomous body with increased investigative and monitoring powers, has been active in monitoring human rights at the local, regional, and national levels. In cooperation with the government and civil society, CNDH has played a key role in recent advances on human rights policies, including the development of a legal migration policy – the first in the Arab world; a ban on civilian trials in military courts that went into effect on July 1; and a change in the law so that rapists can no longer be exonerated by marrying their victims. The latter is part of a more long-term effort to bolster women’s rights in the country, accelerated under the reign of King Mohammed VI and with the 2004 reform of the family code – one of the most progressive laws on women’s and family rights in the Arab world. Beyond women’s rights, efforts are also underway to further promote freedom of the press through a new press code and freedom of association through a series of rulings authorizing previously unrecognized NGOs, including a known anti-regime group in the Sahara. As in any country, human rights challenges nevertheless remain, and the country is taking proactive steps in addressing them with the help of CNDH and its partners in civil society. And those nineteen organic laws? To date, Morocco has passed ten, with a few additional ones defining more complex issues such as advanced regionalization. These relate largely to the functioning of the government as a result of changes defined in the Constitution. They include an organic law on political parties; on the organization and function of both chambers of Parliament (Representatives and Councilors), as well as parliamentary commissions of inquiry; the organization and work of the government; the nomination to high office within public administration (governors, Ambassadors, etc. ); finances; the Constitutional Court; the Economic and Social Council; and advanced regionalization, as discussed above. Where implementation has been admittedly slower is on the organic laws relating to the judiciary (though reform of the penal code and judicial reform is in the works); the rights of citizens vis-à-vis the legislative process; and Amazigh as an official language. Of course reform is about more than adopting laws. Ensuring their initial and continued implementation is what matters most. So capacity-building, promoting good citizenship, and empowering citizens is a broad and challenging mandate. Morocco has a long way to go in this regard — and in addition to political reform, the country faces real economic challenges that also require attention. For the moment, Morocco’s approach has brought stability and security to the country. It will need to continue down the reform path to maintain that – as well as keep its citizens engaged in the process – but it is certainly headed in the right direction and its progress seems irreversible.